Travel, relax and fun for less, for every fun loving traveler looking for long stay without draining their wallet. Very clean rooms (bathrooms decent) and great location! 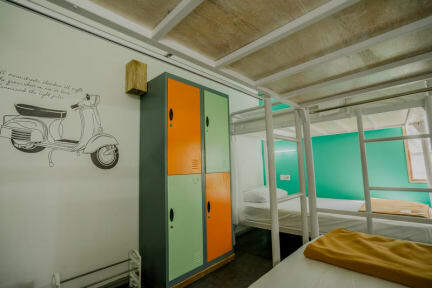 Definitely not a hostel you go to to socialize but would still recommend! Very comfortable bed, lovely lounging and outdoor area, and the location is highly accessible to everything you could need!! The staff was super friendly and helpful whenever called upon for assistance. The lockable cupboard was a bit on the small side and there’s nowhere to put stuff in the shower, which it a tad frustrating, but overall a great place to stay. The staff are lovely and the beds are clean and confortable. not al9t of space to store belongings in the too. which was annoying. good common area and shared kitchen but sadly the atmosphere was very quiet and there's weren't many people to meet and talk to. Walking distance to everything, shops, restaurant and beach. Staff were all friendly and helpful, although some struggle with English. Breakfast included is ok, toast with jam. Rooms and facilities very clean and good! Hostel is nicely located near to the market and restaurants. Not too far from the airport. I was staying at 4 bed dorm. The only issue I had here were the smelling bathrooms and broken toilet latches. They have a huge common room which was mostly empty during my stay. Breakfast is normal bread,butter,jam, tea/coffee. People working here are helpful and will try to work things out for you. Wi-fi works fine. Paid Laundry is just on the floor below. Really cosy hostel. Very quiet. Not much atmosphere. Wouldn't recommend if you're a solo traveller. But it's really chilled and nice. We were slightly disappointed with this place. Our 4 bed dorm was tiny, even smaller than it looks in the pictures which made it awkward with other people in the rooms. The included breakfast is just toast & jam which is fine but for the money you’d think there would be more option. A few power cuts whilst we stayed along with literally no atmosphere. Perfect if you just want to chill but otherwise would stay else where. HOWEVER every single staff member was lovely :).